Following Mike’s analysis on Swaptree I have compared it with SplitGames , a French company that is also playing in the courtyard of product trading community but that is playing by different rules. In my view, more relevant. The service is available in French only for now. SplitGames is only is focusing on videogames. This category is probably the most relevant for product trading if you consider the life cycle of a product (quite short) and the high prices of new hot games. Teenagers cannot usually buy a new game every 3 months but they really want to play many new games. On SplitGames you declare what you have but most importantly what you want. They will guarantee the transaction and match traders in a safe and simple way. 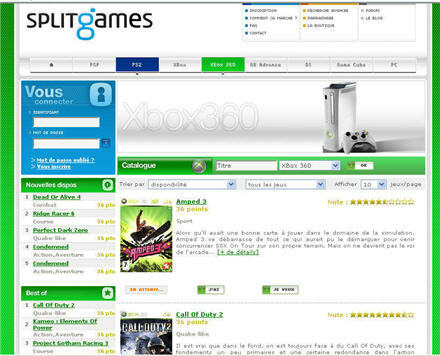 Each game has a value in points based on retailpricing, date of release, and supply and demand of the game on the site. Each time you trade a game you accumulate points you can use to acquire a new game. The mechanics is simple and clear. They’ve bypassed Swaptree’s algorithmic approach for a pure marketplace. SplitGames is not free. But on the other side they guarantee a trading system that works and that enables you to avoid bad surprises (on delivery, choice of games, secure transaction, etc.). Of course this model is also good for the company because success of service will drive directly success of revenues. But most importantly SplitGames manages to build a true vertical community on gaming. Each game has his forum and can be rated and commented. This creates a dynamics that will serve well the company in eventually achieving its ultimate goal: generate game trading. To conclude, Swaptree’s approach is general, algorithmic and advertising based. SplitGames is vertical, premium and community driven. In my view the second approach has better chances to win not only because of its business model but mainly because users will feel they are part of a community where they can receive what they want and trade what they don’t want. Let’s hope SplitGames will be soon available in English.